Sometimes, just sometimes, things in the universe can be damn near perfect. Everything lines up correctly and all problematic matter just, well dissipates. 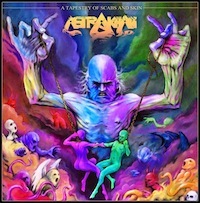 With “A Tapestry of Scabs and Skin”, ASTRAKHAN have mimicked that feeling of universal contentment almost perfectly, whilst projecting freshness, serenity and satisfaction into their Progressive Sludge Metal power. “A Tapestry of Scabs and Skin” is the third EP from the Canadian outfit and from the opening notes of “Cupids Fist”, the magic of ASTRAKHAN is clear. With constant tempo changes reminiscent of MASTODON, “Cupids Fist” is a rolling, well designed master plan that shows how great this genre is meant to be. Musically “Cupids Fist” has more twists and turns than a wormhole in the fabric of time, with ASTRAKHAN executing their storytelling with COHEED AND CAMRIA-esq precision. “Blinded by the Diamond Planet” moves this meticulous masterpiece forward effortlessly, as ASTRAKHAN continue to display more riffs in the first 2 minutes of the track than many bands display during the course of an entire album. But when the drum pattern changes and the main riff kicks in, the listener is flung into something pretty epic. The dual vocal attack ASTRAKHAN use on “Blinded by the Diamond Planet” not only sounds brilliant, but continues to add further layers to this multi-dimensional beast. “A Tapestry of Scabs and Skin” is a shape shifter, a hybrid if you like. The way ASTRAKHAN structure songs moves and evolves constantly, so just as the listener starts to get comfortable, everything changes. “Rest in Depths” has the heaviest riff of “A Tapestry of Scabs and Skin”, but is complimented perfectly with the lighter verses and the clean vocals. In fact, everything on “A Tapestry of Scabs and Skin” compliments each other; the underlying bass riffs are complimented by the monstrous drum beats, the clean guitar brings out the best in the heavy, and again the dual vocals continue to add depth and endurance. The final track on “A Tapestry of Scabs and Skin” is “The Pillarist”, a slower, more melodic track that does not slow any of the momentum the rest of the album has gathered. “The Pillarist” is riff after riff, twist after turn, it’s the kind of track you can get lost in listen after listen; It really is a pleasure to hear it. ASTRAKHAN have created a formula that is, well, pretty special, to be fair. They may even have just the right gravitation to become the new emperors of the Progressive Sludge Metal alliance; and for one, I’m hoping so as “A Tapestry of Scabs and Skin” is remarkable.